Your mouth is a lot like the Wild West — home to millions of bacteria and other microbes, some of which are definitely not “the good guys.” But your teeth are well-protected from these hostile forces and their acidic waste products: with enamel shielding the visible part of your tooth, your gums protect the parts you can’t see. As effective as they are, though, your gums aren’t invincible: their greatest threat is periodontal (gum) disease. This bacterial infection arises from plaque, a thin film of bacteria and food particles accumulating on teeth due to inadequate brushing and flossing. The infected tissues soon become inflamed (red and swollen), a natural defensive response from the immune system. The longer they’re inflamed, however, the more likely they’ll begin detaching from the teeth. The gums may eventually shrink back or recede from the teeth, often causing them to appear “longer” because more of the tooth is now exposed to view. Gum recession doesn’t bode well for your teeth’s survival: the exposed tooth and underlying bone can become even more susceptible to infection and damage. In the end, you could lose your tooth and portions of the supporting bone. 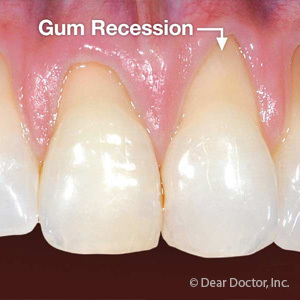 Treatment depends on the severity of the gum recession. In mild to moderate cases, we may only need to perform the standard gum disease treatment of removing plaque and calculus from all gum and tooth surfaces (including below the gum line) with special instruments. This helps reduce the infection and allow the gums to heal and re-establish attachment with the tooth. In more advanced cases, though, the recession may be so extensive we’ll need to graft donor tissue to the area using one of a variety of surgical techniques. Although the right treatment plan can help restore your gum health, there’s another approach that’s even better — preventing gum disease in the first place. You can reduce your disease risk by practicing daily brushing and flossing and visiting your dentist regularly or when you see symptoms like gum swelling or bleeding. Taking care of your gums won’t just save your smile — it might also save your teeth.